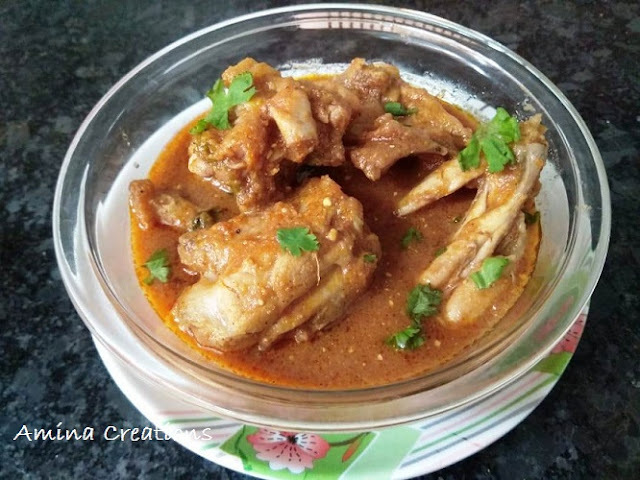 Punjabi chicken curry is a lip smacking chicken delicacy. It can be cooked in less than half an hour and tastes delicious. This is one recipe you can try for any special occasion. It tastes great with roti, rice, dosa, idlis, etc. Clean and wash the chicken and keep ready. Heat oil in a pan, and add the onion paste. Next add garlic and ginger paste and cook till the raw smell goes. Then add bay leaves, cardamom, cloves and cinnamon. Cook for some time. Then add turmeric, red chilli powder, coriander powder, cumin powder and salt to taste. Mix all the masalas well and cook for about 2 minutes. Now add tomato puree and cook till the oil comes out. Then add the chicken pieces, close the lid and let it cook on low flame for 5 to 10 minutes. Then add curd and garam masala powder along with 2 cups of water. Mix well. Bring the gravy to a boil and then reduce the heat to medium, and cover with a lid. Cook for about 10 minutes or until the chicken is cooked. Garnish with coriander leaves. Serve hot with rice or chapathi or naan. Your recipes are good. I will try this item - Punjabi Chicken Curry - and others whenever possible. Very useful website. Congrats and thanks.